Joseph Muscat’s speech to the Party of European Socialists last week has received lopsided coverage in Malta (and virtually none elsewhere). Despite the European stage on which he spoke, the reports had their eye strictly on the national one: whether he looked good boosting his government’s enthusiasm for the fourth industrial revolution, and the impact on his performance of the barracking from the Portuguese Socialist MEP Ana Gomes. All this is relevant but it’s separable from the direction he was urging on the European Socialists. You could, after all, bracket the Monica Lewinsky scandal in discussing Bill Clinton’s political legacy for centre-left parties. You could bracket Tony Blair’s recklessness in the Iraq debacle and still ask about his legacy for the UK’s Labour Party and social democracy. Likewise, you can put to one side Gerhard Schroeder’s venality in seeking employment with the Russian giant Gazprom immediately after leaving office, and still ask to what extent German economic growth since 2005 owes something to his labour reforms. So you can, in principle, put to one side Muscat’s obvious political venality, even his shameful collusion with the indefensible Keith Schembri and Konrad Mizzi, and ask whether what he urged upon the European Socialists was a compelling vision for a free, fair and sustainable Europe, that someone interested in a centre-left vision for Europe could take up or borrow from. Muscat was addressing the socialists as only one of three prime ministers (I believe) addressing the meeting, and as the longest-serving one. Moreover, he was able to say he addressed them as leader of the country clocking in the top figures for economic growth, employment and gay rights legislation. How did this compare with, say, the speech by Frans Timmermans, the PES candidate for president of the European Commission? The gist of Muscat’s 12-minute speech can be summed up in two points. First, that socialists should not be afraid of embracing the changes to the nature of work heralded by automatisation. They should follow ‘common sense’ in generating wealth and follow their values in sharing it. Second, he held up Malta as an example of how this is being done: prosperity without austerity; economic surplus with redistribution through free childcare and school transport, the most liberal gay rights legislation, etc. During the speech itself he was only applauded twice, which is not unusual, but when the applause came is telling. Once it was when he was hailing LGBTIQ legislation; the second when he spoke of how his government facilitated the growing financial independence of women. Here’s the thing. Gay rights legislation requires nothing more than changes to the law – and the impregnable legislative majority to get it passed. If it hasn’t been passed by socialist parties elsewhere, it’s because they don’t have the legislative muscle, not because they need someone to point it out to them. The applause was therefore for progress they’d all like to make... if only the electorates would let them. Muscat did not tell them how they could win enough power to get it done. The applause for progress on women’s rights was something else. Muscat was telling his fellow socialists nothing they hadn’t already done themselves. They applauded because Malta had finally begun to catch up with them. Once more, the information itself contributed nothing to how socialists could provide a compelling enough picture of Europe to voters in May. That leaves Muscat’s urging for socialists not to be Luddites on technology and to follow ‘common sense’. He referred to ‘the new industrial revolution’ as though it’s only the second since the 19th century. Timmermans, speaking at the end, pointedly (and correctly) referred to it as the fourth industrial revolution. This might look like a pedantic point about mere names but it’s symptomatic of something deeper. The last time many social democratic governments were simultaneously in power across Europe and the US was in the decade from the mid-1990s to the mid-2000s. This was the period of what is now known as the third industrial revolution – the onset of the digital age. And it was at this time that you have a series of social democrat parties confidently predicting that you could combine economic ‘common sense’ (code for pro-business, free market policies) with centre-left egalitarianism. Thus you have Bill Clinton ‘triangulating’ the then new economy with job growth and abetting the deregulation of financial services. You have Blair and Gordon Brown saying the UK economy could manage away downturns of the business cycle, greatly increase immigration and boost cosmopolitan London (for which read boosting real estate sales to people whose money had questionable origins). To Blair one could add Schroeder talking of a social democrat Third Way. At the tail end you have José Luis Zapatero, combining a real estate boom and large intake of an immigrant labour force. Any social democrat over 40 should know how all this ended. Blair and Brown never domesticated the business cycle as they thought they would and Brown faced a crash. Loose controls over financial services, real estate and immigration have come back (in different combinations) to haunt the centre-left in the US, UK, and Spain. It is said that one of Emmanuel Macron’s problems is that he is trying to enact in France today what his German and British counterparts did a generation or more ago – except that collective bargaining is always more difficult in France and the French have the benefit of knowing about the centre-left voters’ disillusionment. Where does that leave Muscat’s speech? No one in the audience is a Luddite. They didn’t need to be told about that. So a lot of Muscat’s speech, rather than forward looking, might well have sounded like a throwback to the innocent 1990s – when social democrats had to face the digital revolution. Muscat said he wanted to be the Spotify not the Walkman of politics. But he said it while sounding like the Spice Girls instead of Ariana Grande. In short, Muscat spoke about the fourth industrial revolution in terms that sounded like he was speaking about the third. He leads a country with what appears to be as improvised a policy on labour immigration as Blair’s was, while touting the same ‘cosmopolitanism’, the same vague embrace of new technology, the same light touch on real estate and financial services. If there were a mini-European Assembly feel to Muscat’s speech, it’s because despite everything, he came across as someone emulating an older generation. Malta is still playing a game of catch-up, a dangerous game given what we’re catching up with: the mistakes of an older generation of Europeans (irrespective of political parties). Today, social democrats face the fourth revolution, automatisation, older and wiser, knowing that the “common sense’’ touted a generation ago ended up with a mixed record – some success, but also a betrayal of the core social democrat vote. 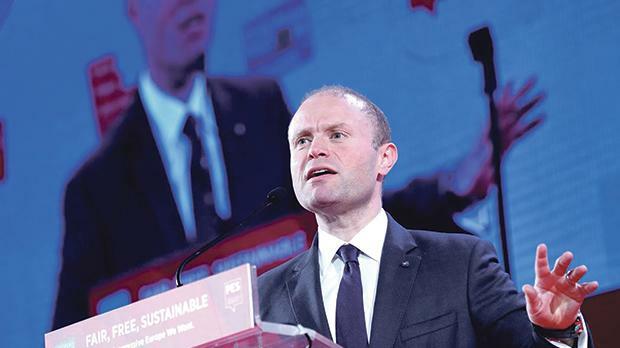 Hence why so many of the other speeches, not to mention the PES platform for May, include resolutions that flatly contradict the Muscat government’s current strategy. Tax avoidance (in which Malta’s financial services have a direct interest) was sometimes discussed as “tax fraud”, and is in any case a target of the PES. Environmentally sustainable development is a key plank in the platform – an area where Malta not only lags behind but is arguably slipping backwards on. Rule of law was a key target of Timmermans. He explicitly mentioned Poland and Hungary, although he has mentioned concern about rule of law in Malta in the recent past, and he pointedly avoided mentioning the Maltese government when saying he enjoyed the support of the Spanish and Portuguese (“and other”) governments, despite there being only three prime ministers in the audience. Listening to Timmermans was a joy. Grave but warm, personal but sweeping in historic scope, the work he put into his recent book on fraternity was evident in every idea. Here’s someone who knows that social democracy isn’t about glib promises to share wealth while undermining solidarity in the very way you create it. Like his great predecessors, including Altiero Spinelli and Jacques Delors, he knows that to achieve equality you first need to feel the obligations of fraternity. If only it were possible to vote for him directly.